At race time roughly 850 people had registered for the second annual Cupid’s Chase 5K in Chicago, and it looked like about two-thirds of them showed up at the starting line, braving this shockingly cold morning in the middle of such a moderate winter. With a wind chill dropping the temperature below zero, clumps of adventurous runners stood around grinning sheepishly at each other, alternately heading to the vendor booths for warmth and clustering together outside to soak up as much sun as possible and trade preparation stories. Running is a sport that is equal parts solo and collective but the cold weather, relatively low registration and smooth organization gave this particular race the agreeable charm of a small-town community event (a small town where the Chicago skyline rises up impressively behind the snow-covered course). Kicking off just north of Stockton and LaSalle, the race wound through the south end of Lincoln Park before heading north up to Diversey and back down again. With the fresh, untouched snow accumulated from the previous night, and the sun shining brightly, the course (a series of park trails that are familiar to most frequent Chicago runners) was as pretty as I’ve ever seen it. At the finish line, the recovery snacks were plentiful and watching the steam rising off finishers’ heads was as entertaining as the race announcer reading off raffle prize and age group winners. Overall: 3.5. Recommended run. 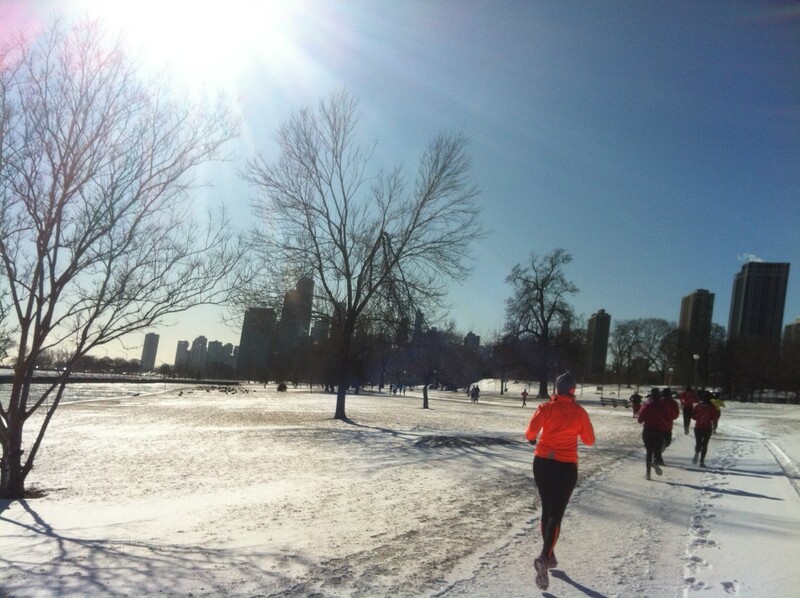 Running in Chicago winter reminds us how running can be insane fun, and the Valentine’s theme gives the race a playful vibe.